Our range of products include fire hydrant valve and industrial fire hydrant valve. Backed by our team of meticulous professionals, we are instrumental in developing best quality Fire Hydrant Valve. 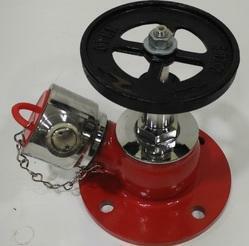 The offered valves are made from rust proof materials to ensure remarkable performance in case of fire emergency. Designed to offer optimum resistance from breakage the highly durable hydrant valves are widely installed for its industry compliant design and unmatched quality manufacturing standards. Further, we are providing the long lasting range of hydrant valves in varied sizes at the best price in the industry. Leveraging on wide expertise, we are instrumental in developing best quality Industrial Fire Hydrant Valve. We implement the cutting edge manufacturing techniques to present all sizes of hydrant valves that are used in providing uninterrupted supply of water during fire emergency. The offered valves are developed from robust grade material and specially designed to withstand rugged pressure and environmental conditions. Further, our experts are conducting rigorous quality tests to bring forth the industry compliant range of hydrant valves that can be availed from us at a leading price.